The first article to utilize the full power of the Seshat: Global History Databank has arrived! The first article to utilize the full power of the Seshat: Global History Databank has arrived! The first article to utilize the full power of the Seshat: Global History Databank has arrived! Philosophers, historians, and social scientists have proposed a multitude of different theories trying to explain the rise of huge complex human societies over the past few millennia. Was the primary driver the invention of agriculture, which seems to be the default explanation held by many archaeologists? Or was it private property and class oppression, as many Marxists believe? Warfare between tribes was a popular explanation a century ago, and has been recently revived under the rubric of cultural multilevel selection. Was it large-distance trade, the need for sophisticated information management, or something else? One of the main goals of the Seshat project is to answer these sort of Big Questions. Nor are these questions only of interest to scholars who like to argue back-and-forth over esoteric details. Issues like the nature and causes of human social development are as relevant to people today as they were for the historical societies we study. Answering these Big Questions points the way to understanding how we arrived at our current state of affairs, and history may also hold the key to avoiding the sort of mistakes that doomed many previous societies. We went about exploring this critical issue by gathering together massive amounts of data about past societies. 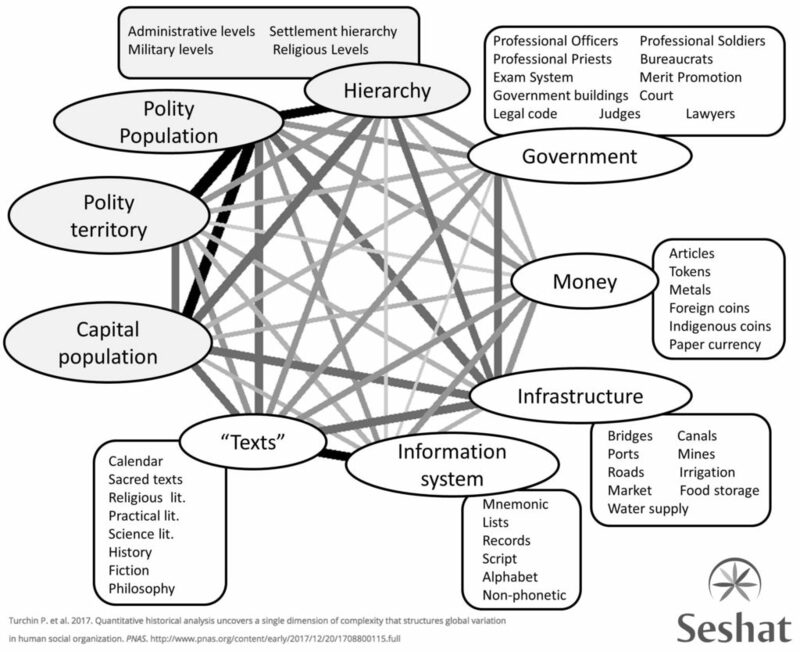 We have just taken an important step towards this goal with the publication of the first article that fully utilizes the power of the Seshat approach: “Quantitative historical analysis uncovers a single dimension of complexity that structures global variation in human social organization,” published recently in the Proceedings of the National Academy of Sciences (PNAS). In this paper, we analyze data describing over 400 past “polities” (ranging from large ones, like states and empires, to small chiefdoms, and even politically independent villages). Our data comes from all world regions (see map here) and extends back in time to the origins of agriculture, in many cases going back thousands of years into the past. 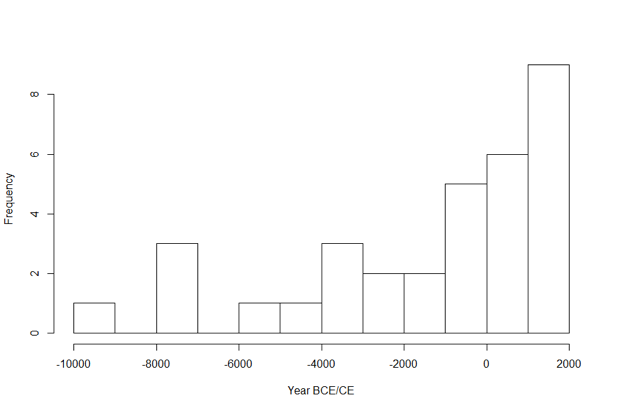 Frequency distribution of the starting dates for data sequences in Seshat Databank. For 10 global sampling points (“late complexity”, see map) data series are short, often starting only when European explorers reached the area in the eighteenth or nineteenth century. For “early complexity” locations data sequences extend back in time between 4,000 and 10,000 years ago. “Intermediate complexity” cases are between these two extremes. These data provide a truly unprecedented scale of historical material to work with, making our statistical analyzes quite powerful. The PNAS article does not yet directly answer the questions we posed in the beginning of this blog post. Rather, it’s a foundational article. In order for us to test theories about what caused the evolution of social complexity, we first need to answer a very basic question: what is social complexity? We need to first know what we want to explain before we can go about tracing its evolution. What we were able to accomplish is to identify nine distinct key characteristics that together measure the developmental trajectories of all the societies used in our analysis (see figure below). Nearly all previous attempts to explain social complexity focus on only one or two aspects, like the size of the largest settlement, or the number of levels in administrative hierarchies. Our unique analysis, tracking a much larger number of variables within a huge sample of historic polities, was able to discover that, in fact, social complexity involves the co-evolution of these nine characteristics together. In taking the first steps to quantify the development of social complexity, the PNAS article provides a very solid, scientifically sound way for us to now answer the more interesting questions: what causes societies to gain or lose this complexity, and what are the consequences of changes in complexity on other aspects of societies? We have already started putting this result to work. Several other articles are already going through their paces in academic journals (but the millstones of scientific publishing grind very slowly) or are about to be submitted. We have also published the data on which the PNAS paper is based, so that others can participate in the fun. You can download the dataset suitable for statistical analyses here. Currently the dataset is available as a downloadable spreadsheet. In the coming weeks, we will be uploading our entire Social Complexity dataset onto our project website in a more easy-to-use, viewable format; keep checking the site for updates!